I really have been struck, working for one very large corporation, Xerox, and one very small corporation, Twelve Entrepreneuring, how we are both faced with the same problem, that the world is perpetually changing faster and faster. Everyone in this room is familiar with Moore’s law, which states that the power of computers is doubling every 18 months. Some even know the law of fiber, which is the backbone of the internet, which says that the capacity of the bandwidth of the fiber is doubling every nine months. Well, that is well known. Now I am going to come back and talk about something having major implications for everyone in this room, that is the law of storage. And the law of storage says that we are capable of doubling storage at the same cost every year. And I am going to argue in a second that there’s maybe even greater discontinuity, that maybe it’s going to go up even faster than that. And the final law is the law of content. This law of content really has to do with the law of communities, because most of us here believe that most content really comes from communities in one way of another. And that basically, Metcalfe’s law, which everyone is familiar with, says the power of the network goes up with the square of the networked people interacting with it. Those of us who have been looking at the internet over the last ten years have realized that the internet’s primary aim is to support virtual communities, communities of interest in one way or another, communities of practice more, but communities of interest definitely. If you think about it, out of n people, there are 2n possible communities of interest. 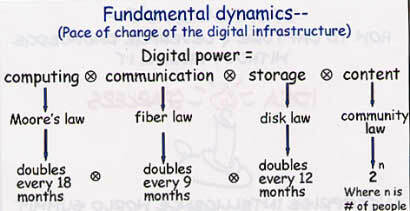 The hidden dynamic, why the internet may be taking off as it has, may have more to do with the law of community, than with Metcalfe’s law. And it’s very interesting to realize that 2n is an astronomical number, and in fact all these laws work together. What all this means is that we are living in a period of exponential change. I don’t want to bore you with the physics, but there are a lot of reasons to believe that this phenomenon will continue for at least another ten to twenty years. We have been about hearing about Moore’s law, but basically that framework is going to be here. Now let me go back and look at the law of storage for another moment, because I think that this is really pretty astounding. I am holding before you a complete rotating disk. This comes out of my digital camera. This disk is one gigabyte of storage, complete, compact, sitting right here. What’s very interesting to me is that the rotating disk in here flying at a very fast speed, in the camera, the camera is on, and the head of the disk is actually flying one micron above this, And so in some ways the real breakthroughs are going to happen in terms not just to how you move atoms to bits, but how do you move back again, bits into into atoms, working in synchrony together. And so in some ways the real breakthroughs are going to happen in terms not just to how you move atoms to bits, but how do you move back again, bits into into atoms, working in synchrony together. 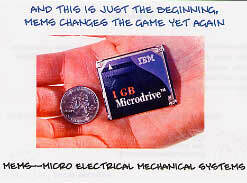 And in fact, I will tell you that some new work we are doing ourselves, with some other people we know, in IBM and Carnegie Mellon, is that we will be able to take this size, this up to approximately one thousand gigabytes, in say, five to eight years. So that is faster than the law of storage. Now why do I say this? I say it because we now have to start thinking about a whole new game, thinking about your telephone, your Palm, your cell phone, carrying literally everything you have ever done, with you, every movie you have ever seen, every book you’ve ever read, every paper you have ever read or written, is something with you. But what this suggests is that the whole world of wireless communication is going to be triple-charging knowledge into your knowledge store that you carry around with you. So you have your world with you. And this starts to change an awful lot of things. And I think that it behooves us to think through some of this, because I believe that an awful lot of the architecture on which we build our systems today don’t quite understand just what the power of this really means, when we start to carry these things. By the way, the kind of storage we are now talking about will be about the same size and will require virtually no power. So you really will be able to carry this around. It needs almost no batteries at all. With all this change, as I stated just a moment ago, change is going to keep being with us, it does suggest, and one of the reasons that we are all here today, is that the key to survival, maybe the only place where you can get a sustainable edge in the enterprise that you are in, or the industry, has to do with how you learn faster than your competitor. How do you share those learnings more rapidly, within your firm, how do you in fact engage in agile experimentation, and reflection. The reason I put in reflection and some of you can already tell where I am headed, is that communities of practice could turn into very powerful entities for reflective practice and we will come back to that.